KIEV, Ukraine -- A Ukrainian group is making waves online with satirical musical parodies decrying Russia’s support for separatists in eastern Ukraine. 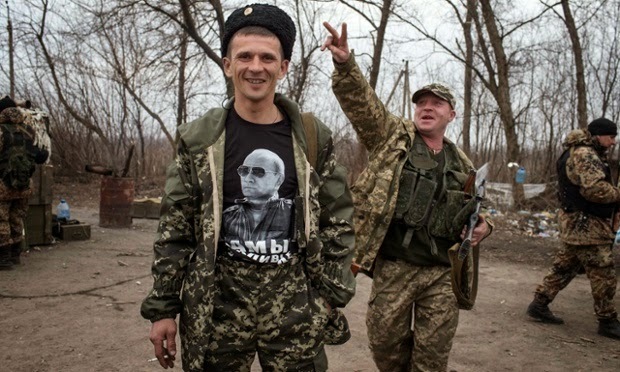 A pro-Russian rebel wears a t-shirt depicting Russian President Vladimir Putin. The songs composed by the separatist fighters are now subject to satirical videos online. The group, which goes by the name of Mirko Sablic, was created several months ago to counter what it calls Russian “propaganda” about the deadly conflict in Ukraine’s east, where fighting erupted once again last week. “We don’t take part in military action. We don’t know how to shoot,” group member Yevhen Tatarchenko said. Mirko Sablic has already authored a string of clips, each of which has drawn tens of thousands of viewers. The group writes its own songs and uses a collage of Soviet film excerpts and footage from war-torn eastern Ukraine to illustrate them. Mirko Sablic’s latest clip is titled Novorossia Anthem, in reference to the name separatists in Donbass give to the land in southern and eastern Ukraine they say they are seeking to control. So far it has been viewed more than 70,000 times. The song is a spinoff from March of Stalin’s Artillery, a famous Soviet-era song paying tribute to the Red Army. The spoof anthem blames Russia – and Putin personally – for stirring up separatist sentiment in eastern Ukraine and arming the rebels. “Separatists, Putin gave an order!” the refrain goes. In the three-minute clip, Lyube’s front man Nikolai Rastorguyev – who is also a lawmaker with the ruling United Russia party and a loyal Putin supporter – is dubbed, making him appear as if he is performing the staunchly anti-separatist song. The video obviously riled Lyube, whose producer succeeded in having the video taken down from YouTube, albeit temporarily. It was later posted back on the video-sharing site, accompanied by a warning from Mirko Sablic that further attempts to block its clips will be met with “a new parody of the songs of each plaintiff”.